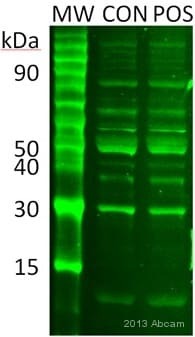 Recombinant human RANTES protein (ab9680) can be used as a positive control in WB. Our Abpromise guarantee covers the use of ab9679 in the following tested applications. Neutralising Use at an assay dependent dilution. To yield one-half maximal inhibition [ND50] of the biological activity of hRANTES (100.00 ng/ml), a concentration of 5.0 - 7.0 µg/ml of this antibody is required. 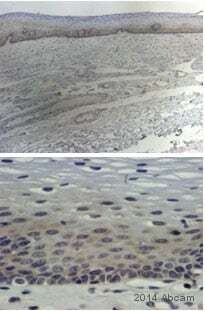 ab9679 staining RANTES in Human skeletal muscle (gastrocnemius) tissue sections by Immunohistochemistry (IHC-P - paraformaldehyde-fixed, paraffin-embedded sections). Tissue was fixed with methacarn and blocked with 10% serum for 20 minutes at 25°C; antigen retrieval was by heat mediation in citrate buffer (pH 6) and tris buffer (pH 8). Samples were incubated with primary antibody (2μg/ml) for 1 hour at 25°C. An undiluted HRP-conjugated Mouse anti-rabbit IgG polyclonal was used as the secondary antibody. ab9679 staining RANTES in human breast invasive ductal carcinoma tissue section by Immunohistochemistry (Formalin/PFA fixed paraffin-embedded sections). Tissue underwent heat mediated antigen retrieval in sodium citrate buffer (pH 6.0). The primary antibody was used at 2.0 ug/ml and incubated with sample at 4°C overnight. A HRP-labeled polymer detection system was used with an AEC chromogen. Formalin-fixed, paraffin-embedded human breast cancer tissue stained for RANTES using ab9679 at 1/150 dilution in immunohistochemical analysis. Goat anti-Rabbit HRP was used as the secondary antibody. Heat mediated antigen retrieval using EDTA at pH 9 was used before commencing with the IHC protocol. 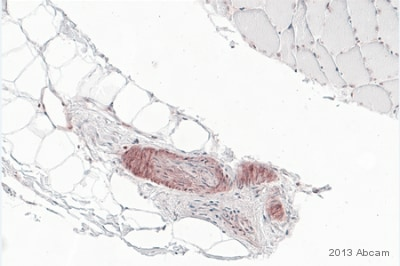 Immunohistochemistry (Formalin/PFA-fixed paraffin-embedded sections) - Anti-RANTES antibody (ab9679)This image is courtesy of an annoymous Abreview. Formalin-fixed, paraffin-embedded mouse colon tissue stained for RANTES using ab9679 at 1/150 dilution in immunohistochemical analysis. Goat anti-Rabbit HRP was used as the secondary antibody. Heat mediated antigen retrieval using EDTA at pH 9 was used before commencing with the IHC protocol. Publishing research using ab9679? Please let us know so that we can cite the reference in this datasheet. I am looking to purchase an Anti-RANTES antibody in order to look at RANTEs expression in human platelets. I looked at product ab10590 and ab9679. Would either of these for Immunfloresence, or would you recommend a different anti-RANTES antibody? The best choice from what we have is the goat polyclonal ab10590. Other antibodies we have that are raised against RANTES may also work for immunocytochemistry but they have not been tested in this application. The exception is the rabbit monoclonal ab108933 but it has not been characterized as well as ab10590, and I am concerned that, since it is raised against the C-terminus, it might not be able to recognize platelet RANTES, depending on how RANTES is processed by platelets. The following note from the UniProt entry for the protein mentions that leukocytes secrete an N-terminal fragment. "N-terminal processed form RANTES(3-68) is produced by proteolytic cleavage, probably by DPP4, after secretion from peripheral blood leukocytes and cultured sarcoma cells." Antibody is in liquid form but on the datsheet we say that it is lyophilised and it needs to be reconstituted with 200µl of sterile water. I have been in contact with the lab, I can confirm that ab9679 has already been reconstituted in 200ul sterile water. Since this antibody was lyophilised in PBS, this means that upon the addition of the water, the antibody has been re-dissolved in PBS. There is an error on the datasheet concerning the reconstitution in sterile water and we apologize for this and thank you for bringing this to our attention as it will allow us to update our datasheet.